Missoula. The Garden City. Zootown. God’s Country. No matter what you call it, Missoula, Montana is a rare combination of urban and outdoor, cultured and down-home, cowboy and hippie. Make it Missoula is the stage upon which all these diverse personalities and lifestyles dance, and make Missoula the interesting and lively place we love. Learn more about Missoula, MT. High Water is Dangerous. Don’t Go! Missoula, Montana is located along the Clark Fork and Bitterroot rivers. Located in Western Montana at the convergence of five mountain ranges, Missoula is sometimes referred to as the “Hub of Five Valleys." Photo by Mark Mesenko, mesenko.com. Since 2000, Missoula has been the second largest city in Montana. The 2010 Census stated Missoula’s city population at 66,788 and the Missoula Metro area at 109,299. Missoula, MT natives and residents are referred to as "Missoulians." The city now named Missoula was founded in 1860. At the time the area was officially part of the Washington Territory and called Hellgate Trading Post. Because the area was originally home to several mills that provided supplies to western settlers traveling along Mullan Road the name was changed to Missoula Mills, then shortened again to its present day name of Missoula. By the 1880s, the Northern Pacific Railway came through the area and Missoula matured to support a thriving lumber industry. As the city experienced rapid growth, Missoula was chosen by the Montana Legislature as the site for the new state’s first university. Along with the U.S. Forest Service headquarters which was founded in 1908, the city’s lumber industry and the university would serve as forerunners of the local economy for the next hundred years. However, by the late 1990s, Missoula’s lumber industry had all but disappeared. Today the city’s largest employers are the University of Montana and Missoula’s two hospitals. Photo by Paul Queneau, PQPHOTO.NET. The University of Montana ‒ Missoula (often simply referred to as the University of Montana, UM, or U of M), was established in 1893. 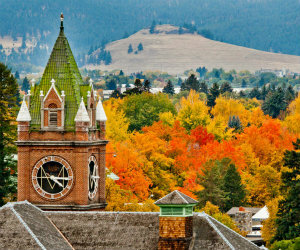 UM is the first and largest university in Montana with a 2010 student population of 15,642. The campus houses 6 colleges and 3 schools. The university is the flagship campus of the four-campus University of Montana System and is its largest institution. 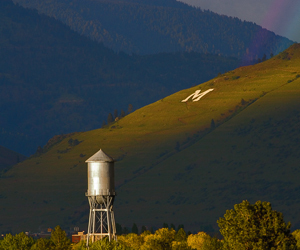 The main campus is located at the foot of the mountain bearing Missoula's most recognizable landmark, a large letter "M" on Mt. Sentinel. Rolling Stone magazine called UM the "most scenic campus in America" and Outside magazine dubbed it "among the top 10 colleges nationally for combining academic quality and outdoor recreation." The University of Montana ranks 17th in the nation and fifth among public universities in producing Rhodes Scholars, with a total of 28 such scholars. The University of Montana has 11 Truman Scholars, 14 Goldwater Scholars and 31 Udall Scholars to its name. UM’s Maureen and Mike Mansfield Library houses the earliest authorized edition of the Lewis and Clark journals. The city is governed by a mayor-council government with twelve city council members, two from each of the six wards. In and around Missoula are 400 acres of parkland, 22 miles of trails, and nearly 5,000 acres of open-space conservation land. Missoula, MT has been home to a number of notable individuals in a wide variety of fields. In politics, Jeanette Rankin, the first woman elected to congress, was born and raised in Missoula. Senator Mike Mansfield, the U.S.'s longest serving Senate Majority Leader began his political career while living in Missoula. Max Baucus, Montana's longest serving U.S. Senator and currently U.S. Ambassador to China, also established his political career while residing in Missoula. Other notable Missoula citizens included athletes, Pro Football Hall of Fame Quarterback John Elway, and former Milwaukee Bucks coach Larry Krystowiak. Actor Dana Carvey and filmmaker David Lynch were both born in Missoula while Carroll O'Connor and J.K. Simmons both attended UM. Also notable is author Norman Maclean, whose book, A River Runs Through It, later became an acclaimed movie, and chronicles Maclean’s life in early-20th century Missoula, Mt.